In every generation people have made predictions of things to come. Imminent events. Far-off events. Likely events, unlikely events. And sometimes they have come to pass. But sometimes they didn't. They haven't. And they won't! Psychics prophesy. And few people become upset when such predictions miss the mark. Weather forecasters prophesy, and people take it in stride if it rains at the picnic. Even political analysts and pollsters predict. All they have to do when things go wrong is to red-facedly explain why they erred. But let a religious figure or group make a prediction — and miss — and it shakes people's faith in God! But is it really God's fault? It may not be true that "you can prove anything by the Bible," but many people try. "The Bible says...." they insistently and dogmatically proclaim — when the Bible says no such thing. They may think it does. They may be totally sincere, but they may be wrong. They misunderstand and misinterpret Scripture. But should we blame God? The fact of the matter is that much of what practically all people think they got from the Bible, read right from the Bible, and can "prove" from the Bible, they actually got right from their own ideas, or from other people — parents, friends, church associates — or possibly even from a spiritual source, through the subtle planting of a thought in the mind by an evil spirit. Nowhere is this fact better illustrated than in people's understanding of prophecy. When human expectations don't come to pass as proclaimed, it isn't the Bible's fault. The problem is that human interpretations of what the Bible means are often in error. Much of what practically all people think they got from the. Bible, read right from the Bible, and can "prove" from the Bible, they actually got right from their own ideas, or from other people — parents, friends, church associates — or possibly even from a spiritual source, through the subtle planting of a thought in the mind by an evil spirit. War I. Ostensibly his ideas came from the Bible. Like other prophetic expositors, he had built up an imposing theory by taking dearly held personal opinions about Bible prophecies and propping them up with a show of biblical verses. And part of them, through the '30s and '40s, and even the '50s, did seem to be coming or about to come to pass. But was his understanding wholly from the Bible? It was not. It was derived from his own interpretation of the Bible plus commonly held public opinions and fears, seemingly apparent trends, and a liberal dose of private and personal guess. Because his understanding fell short, his prophetic interpretation (concerning a great race war which he supposed to be imminent and which would bring on the end of the world) eventually flopped. Few people alive today have ever heard of G. G, Rupert. A few that continued to follow closely his thinking were finally compelled to understand the "yellow" Asian peril as being "red" communism, primarily that of the white Europeans of the U.S.S.R.
God's prophecy in the Bible had not failed. But man's understanding of it had, and there are reasons for this. There are important spiritual and doctrinal principles involved in all such situations. The first and most important of these is that it is not God's will that man be able to perfectly understand the future. Enabling man to acquire detailed, specific knowledge of yet future events has never been God's purpose. His prophecies reveal only a general overall picture. The real purpose of most prophecies is revealed in principle in John 13:19: "Now I tell you before it come, that, when it is come to pass, ye may believe...."
When the prophet Daniel continued to ask for more and more detailed understanding of the broad, all-inclusive prophecies that had been revealed to him, God answered by the angel: "Go thy way, Daniel: for the words are closed up and sealed till the time of the end" (Dan. 12:9). Neither Daniel nor any man was or is allowed to understand them perfectly and precisely until they are actually coming to pass. A second important principle is that God is not willing for man to determine for Him how He will or must fulfill any prophecy. That would mean that man would be ruling God, rather than that God does and will rule over man (see Ezekiel 20:33 and Isaiah 40:10 as examples of God's determination to be the Ruler). 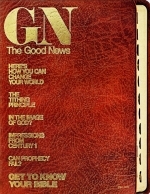 Principle three is that in order to implement the preceding principles it appears that God has had the prophecies of the Bible written ambiguously and indistinctly so that He can make them work out at the time and in the manner when and how He chooses — and yet fulfill His written Word to the letter. God is flexible. He isn't committed to an irrevocable timetable. There was the case, written for an example to us, of God's promise — a prophecy — to Abraham that He would make of Abraham's seed a great nation. But because of the actions and attitudes of the people of Israel who were that seed, God stood ready to scrap His intended way of fulfilling the promise by wiping out the nation as a whole and raising up a new nation of the seed of Moses (Ex. 32:10). All that was lacking was the go-ahead from Moses. God had committed Himself. He was willing, if need be, to change. The new nation from Moses would still have been the seed of Abraham, and the promise would have been perfectly fulfilled another way. Years ago, when I was in college, a roommate of mine had a personal standard joke that illustrates this principle. "I can tell you exactly when Christ will return," he would say. "When?" we would eagerly demand. "It's the hour that you think not [Matt. 24:44; Luke 12:40]," he would reply. "He won't come at any time when you expect it. And that's for certain." It appears that God has had the prophecies of the Bible written ambiguously and indistinctly so that He can make them work out at the time and in the manner when and how He chooses — and yet fulfill His written Word to the letter. God is flexible. He isn't committed to an irrevocable timetable. stated, or unstated but tacitly understood, conditions which are in the province of humanity. Take the prophecy of Jonah against Nineveh. God had literally forced Jonah, by the storm at sea and the sojourn in the great fish, to go and warn Nineveh of imminent destruction. Then God changed His plan when the Assyrians repented. Jonah was mightily displeased, although he knew all along that the threatened destruction was conditional: "... Was not this my saying, when I was yet in my country? Therefore I fled before unto Tarshish: for I knew that thou art a gracious God, and merciful, slow to anger, and of great kindness, and repentest thee of the evil" (Jonah 4:2). Jonah knew in advance that God would repent (change His mind) if the people repented. And even though Jonah may never have told the Ninevites it was conditional — at least it is not so recorded — the king understood it that way (Jonah 3:9). Was the entire prophecy against Nineveh therefore scrapped, because the Assyrians repented? It was not. Only the time element of it was changed. When they returned to their old ways, the punishment was again set in motion. And it finally came to pass in 612 B.C. when Nineveh was destroyed. What about the apostle Paul's statement that sometimes "prophecies will fail"? Just What Do You Mean — "Fail"? Because of misuses, abuses and vanity among the members of the first-century Corinthian church, the apostle Paul found it necessary to devote three whole chapters of his first epistle to the Corinthians to the subject of spiritual gifts. He begins chapter 12 with the words, "Now concerning spiritual gifts...." As he continues, he discusses the purpose and function of spiritual gifts, and distinguishes between one kind of gift and another in terms of two things: 1) which gifts are "best" (I Cor. 12:31); and 2) what, after all, will continue to be useful in to eternity. "In a word, there are three things that last for ever: faith, hope, and love; but the greatest of them all is love" (I Cor. 13:13, The New English Bible). To help develop this context the apostle made his famous statement, so often now misunderstood and taken out of context, that "prophecies, they shall fail" (I Cor. 13:8). Prophecies are among the temporal gifts which are contrasted with the three things which will endure. And this is the key to Paul's meaning. It was the gift of prophecy that was to "fail" (from Greek katargeo, properly defined as "to render inoperative or idle"). The gift of inspired prophesying, which was known and exercised in the early Church before the New Testament was written, was to disappear. Thus, the scholarly Jerusalem Bible says: "Love does not come to an end. But if there are gifts of prophecy, the time will come when they must fail; or the gift of languages, it will not continue for ever; and knowledge — for this, too, the time will come when it must fail." Notice that Paul's declaration has no reference to God giving warnings or predictions which He could not or would not, for any reason, bring to pass. The question is not in any way one about predictions of events that never happen. And notice also how the apostle's next words illuminate some of the points explained earlier in this article. "... For our knowledge and our prophecy alike are partial [in other words, we lack most of the details concerning the actual working out of the fulfillment of any prophecy], and the partial vanishes when wholeness comes [when the actual events can be seen in their fulfillment]. When I was a child, my speech, my outlook, and my thoughts were all childish. When I grew up, I had finished with childish things" (verses 9-11, NEB). Applied to prophecy, this refers to the coming time when we will be finished with partial predictions and with guesses about how things will happen. "Now we see only puzzling reflections in a mirror [or, we see through a dim window — a reference to the ancient windows made of thin sheets of horn, translucent crystalline stone or greased paper before today's clear glass was manufactured], but then we shall see face to face. My knowledge now is partial; then it will be whole, like God's knowledge of me" (verse 12, NEB). Still today, like Paul, we are unable to see clearly to the actual fulfillment of prophecies — as God sees — but we see only dimly. And that is by God's intention. That the scripture itself reveals: "... No one can interpret any prophecy of Scripture by himself' (II Peter 1:20, NEB). Why? Because, as the rest of the verse explains, it was not man who prophesied — and is able to bring his prophecies to pass — but it was God, through His Holy Spirit, who predicted and will fulfill. That is why human interpretations, additions, or detailed applications of Bible prophecies can only lead to mistaken results and wrongly directed zeal. Those are human prophecies — which have failed, are failing and will continue to fail. Despite the possibility of human error as shown by the foregoing points, Jesus Christ did commission His Church to preach and publish the gospel of the Kingdom of God to all the world as a witness (Matt. 28:18-20; 24:14; Mark 13:10; 16:15; Acts 1:8). And the gospel is prophetic! Jesus Christ said: "Watch ye therefore, and pray always, that ye may be accounted worthy to escape all these things [prophesied future happenings] that shall come to pass, and to stand before the Son of man" (Luke 21:36). The general tenor of Bible prophecy is really coming alive in this, the opening moments of the last quarter of our century. It promises to be the most traumatic quarter century in the history of man. While keeping the crucial points of this article fully in mind, we all need to vigilantly watch world events as they unfold, and observe the fulfillment of many prophecies as revealed by God in the Bible. Yes, human error is always possible — but God's Word is sure!